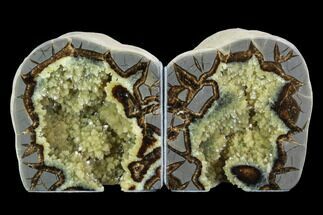 This is a pair of gorgeous bookends made from a cut & polished septarian geode. 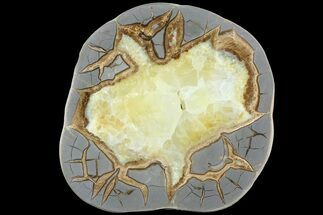 The septarian was mined West of Orderville, Utah and was deposited during the Jurassic period, about 150 million years ago. 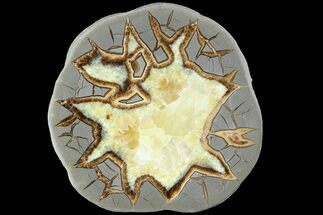 The patterns made by the yellow calcite crystals, brown aragonite and grey limestone are stunning. The edges of the bookends have been lined with felt. 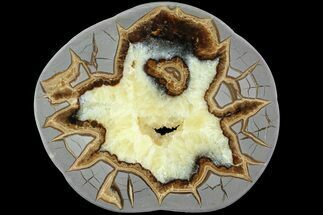 Septarian or septarian nodules are concretions containing angular cavities or cracks, called "septaria" which have become filled with calcite and aragonite. 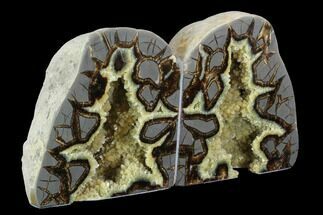 A concretion is hard, compact mass of rock that often forms around decaying organic matter. 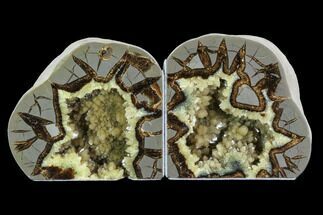 In the case of septarian nodules the concretions formed around decaying sea-life in a marine environment. The exact mechanism for how the cracks form in the concretions is a mystery. One possible mechanism is the dehydration of the clay-rich core of a concretion causing it to shrink and crack. 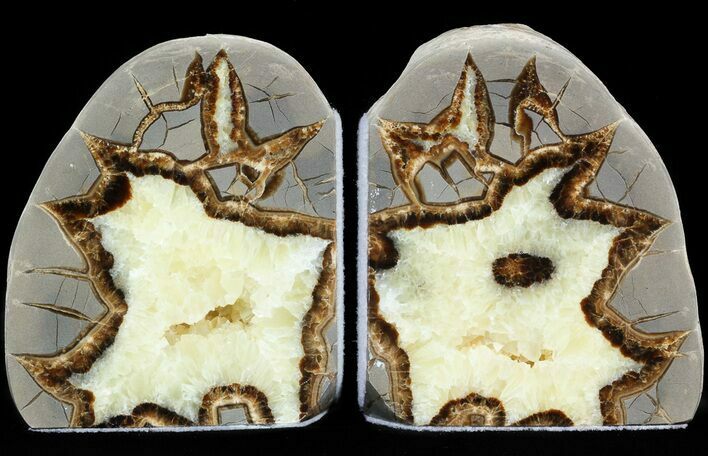 Another is the cracks being due to the expansion of gases produced by the decay of organic matter within a concretion. Earthquakes have also been a suggested as yet another mechanism. 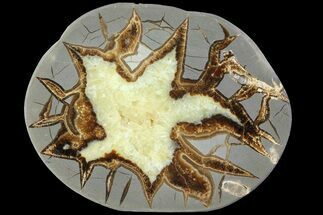 The cracks in the concretions are then filled in with minerals such as calcite (yellow) and aragonite (brown) and sometime pyrite causing the very interesting patterns, which have often been described as dragon's skin. 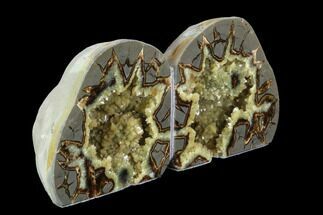 They are frequently found as geodes with hollow, calcite crystal filled cavities. 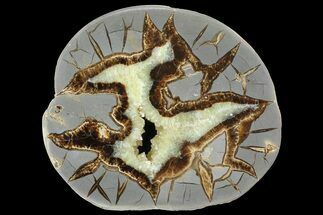 More rarely the fossils that originally started the formation of the concretion are still preserved in the septarian.